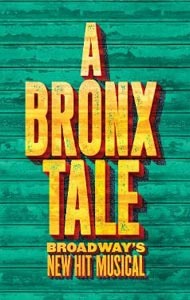 A Bronx Tale is a streetwise musical that takes you to the stoops of the Bronx in the 1960s—where a young man is caught between the father he loves and the mob boss he’d love to be. Featuring a doo-wop score, A Bronx Tale is a story about respect, loyalty, love, and above all else: family. Really enjoyed this show from start to finish. Directed by Robert De Niro, this play's talented cast performs this story in flawless and convincing fashion,. The singing and stage presence was excellent. Special shout out to Joe Barbara (Sonny), Richard Blake (Lorenzo), Joey Barreiro (Calogero/C) and Brianna-Marie Bell (Jane) on an outstanding performance.